Q) Surender Reddy is known for his stylish films. Why did you choose him to direct a challenging epic like Sye Raa? A) A director must be able to handle any sort of story. In fact, more than my confidence in him, I went ahead with the project only after Suri told me that he could pull off this project. Q) What is the film’s budget? A) I am not going to reveal the numbers (laughs). But it’s definitely going to be huge. Sye Raa has been dad’s dream for 12 years. Also, Dad always had a regret that he never acted in a costume drama in his career spanning 35 years and 150 movies. So we are not thinking twice about the budget or profits and are making the film on a grand scale. It’s a blessing that I got the opportunity to give him the film he wanted. Q) When are you planning to release the film? A) We are looking at a summer 2019 release. The exact date will be announced later. Q) In how many languages are you going to release the film? A) As of now, Sye Raa will be simultaneously released in all the major South Indian languages. 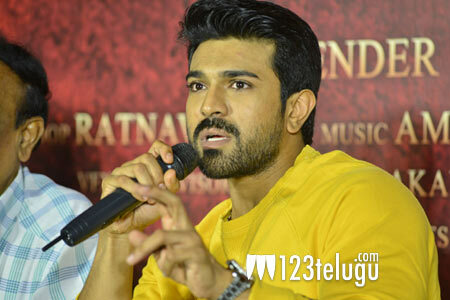 Q) Why didn’t Chiranjeevi attend the teaser launch event? A) (Laughs) Will it be nice if he comes here and tells you all to watch his film’s teaser on his birthday? It’s like a birthday surprise that we all are gifting him. Q) Last shot in the teaser reminded everyone of Kodamasimham. Was it intentional? A) Even I had the same feeling. It was the director and stunt choreographer Lee Whittaker’s idea. Kodamasimham is one of my favorite movies. I learnt horse riding after watching that film. Q) Do you have any plans to screen the teaser in theaters? A) We actually planned a simultaneous release in theaters. But we couldn’t get the permission from the Animal Welfare Board. The process to obtain permission has already begun and we can expect the teaser to be screened in all the theaters in a couple of weeks. Q) Do you think that Sye Raa will beat all the existing box-office records? A) I wish with a pure heart that Sye Raa beats all the records because it’s good for the industry.